Jerrell R. Gray (b. 1989), pianist, conductor, and composer, is a senior at Southern University and A&M College where he will receive two degrees in music. He is a native of Chicago, Illinois. 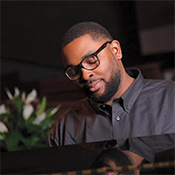 His experience includes studying at the Sherwood Conservatory of Music and competing, as well as placing, at the collegiate level in the DeBose National Piano Competition. Mr. Gray is also a member of the Baton Rouge Symphony Chorus and Mu Phi Epsilon Honors Music Fraternity. He is a versatile musician and has been the musical director for many musicals. He recently completed a project playing lead piano on an independent film that premiered in the Sundance Film Festival. Mr. Gray has three other published choral works, "The Old Rugged Cross," "Nobody Knows the Trouble I See," and "What a Friend We Have in Jesus" with GIA Publications, Inc. He has been invited to present his published works at conferences in Atlanta, Georgia, and Hampton, Virginia. His works have been been performed in Texas , the Bahamas, California, Florida, North Carolina , Washington, D.C. South Carolina, Georgia, Virginia, New Jersey, Alabama, Pennsylvania, Michigan, and Illinois. He is the Founder and Director of the Neoteric Chorale and has also been featured on NBC 33 News/WVLA. Mr. Gray is continuing his education pursuing a Master’s degree in Conducting and Composition.